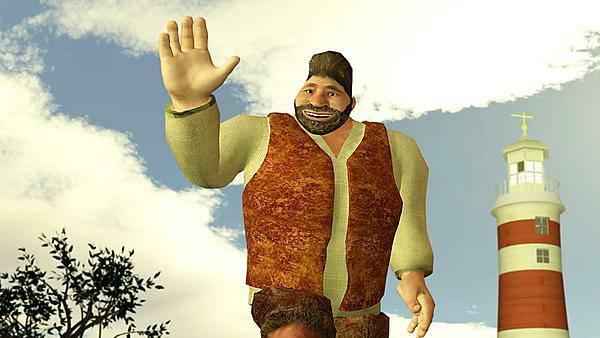 Geoffrey the Giant, star of "Open Wide and Step Inside"
A film which is the first of its kind in the world, is to receive its debut in Plymouth on Wednesday 22 October. "Open Wide and Step Inside" has been produced by the Peninsula Dental Social Enterprise, Peninsula Dental School and Plymouth University, with financial support of £105,000 from the worldwide Wrigley Company Foundation and toothbrushes and toothpaste donated by GSK. The film is the first in the world to use immersive vision technology (where the film is shown in a ‘dome’ theatre with images all around the audience) to engage with five to seven-year olds about looking after their teeth. This is a key age group, because by seven children should be starting to clean their teeth without supervision and making good choices about what they eat and drink, and when. "Open Wide and Step Inside" has been created by dental specialists because figures regarding children's oral health would suggest that other ways to encourage better cleaning, improved diet and frequent visits to the dentist are not working. Two reports this year into the state of children's teeth made shocking reading: the first stated that more children are admitted to hospital for dental problems than for any other health issue; and the second said that 12 per cent of three-year olds across the country had experienced tooth decay. The film comes with an educational pack for teachers and goodie bags for pupils. Central to the plot is Geoffrey the Giant who, with his friend Mouse, lives in the iconic Smeaton Tower on The Hoe in Plymouth. Geoffrey has been eating too many sweets and drinking too many fizzy drinks, hasn't been cleaning his teeth properly and has not visited the dentist – and he has a toothache. His friend Mouse persuades him to visit Daisy the Dentist who, with her magic wand which turns into dental instruments, finds the problem and gives Geoffrey a filling. Along with speaking teeth, Fluoride the Superhero and a catchy song, "Open Wide and Step Inside" looks set to make an important contribution to oral health education around the world. The cast of the film includes members of staff from the Peninsula Dental Social Enterprise and Peninsula Dental School. The main character Geoffrey is played by Mark Bignall from rehabilitation charity Hamoaze House. The animation has been created by the TELMeD team at Plymouth University, who usually produce e-learning tools used to teach medical and dental students. The film has also included pupils from High Street, Ford and St Joseph’s primary schools in Plymouth, who formed the choir for the film's song. The debut for the film will take place in the immersive vision theatre on the Plymouth University campus on Wednesday 22 October, when it will be shown to 40 local school children plus their teachers and classroom assistants. After that there will be a series of showings for other schoolchildren both at the immersive vision theatre and in a mobile immersive vision unit. Dr Robert Witton, Director of Social Engagement and Community-based Dentistry, Peninsula Dental Social Enterprise, said: "We are incredibly excited about "Open Wide and Step Inside" – we are really breaking new ground in oral health education here. Recent reports show that there is still more to be done to help children and those who care for them protect their teeth and improve their oral health. While methods to date have gone some way to address these issues, there is a need for new, innovative approaches and we think our film is one of those. Our thanks go to the Wrigley Foundation, local schools and the TELMeD team at Plymouth University for helping Geoffrey and his friends make it to the big immersive screen."